My name is Ananth, I was born in Hyderabad, I am a person with Cerebral Palsy (CP). I studied at Spastics Society of Karnataka (SSK) in Bangalore from the year 1982. My father searched for the job in Bangalore so as to enable me to get suitable training and schooling. I am one of those few lucky 5children who are associated with the special school since its early days. We are forever thankful to Mrs. Alur who sowed the seeds that has now spread its branches under the able guidance and determination of our beloved guru and the Director of SSK Mrs. Rukmini Krishnaswamy and her team. I was also lucky to be Mrs. Poonam Natarajan’s student for 2 years who started Spastics Society of India in Chennai. I had many sweet memories at both these centers of special education. 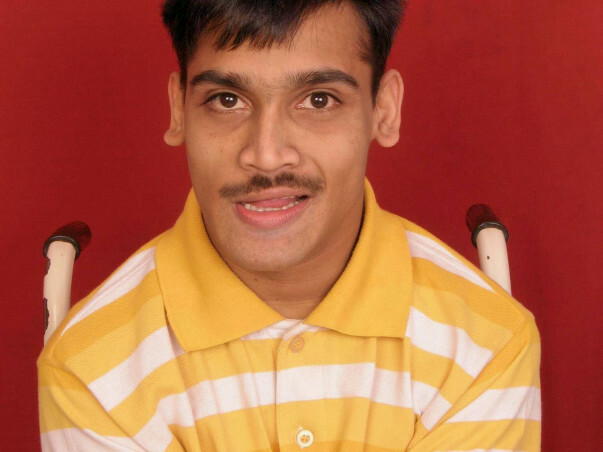 I was the first non-verbal Cerebral Palsied student who passed 10th public exam from NIOS and learnt computers. All this was possible due to the dedicated staff and volunteers of SSK. At present I am doing home based data entry from Amba center. As a young boy with disability, I had a lot of concern for the CP children and sent mails to Sri Chandrababu Naidu, ex Chief Minister of Andhra Pradesh but I did not get any reply. Since then I developed a strong desire to start a small center with the name – ‘Sathya Center for Differently Abled Children’ in Andhra Pradesh – to provide the much needed services in my hometown, with the support of my parents. It seemed extremely difficult to start on our own with our limited resources and constraints. I constantly prayed to Sathya Sai Baba to show me the way. 28th December 2010 is unforgettable day, when I visited Manasa Special School for the intellectually challenged, The founder and the Secretary of ‘Manasa’ Mrs. Sarvalaxmi is amma’s close friend; Mrs. Usha Aunty’s sister and also a parent. She and her team were so kind enough to accept our request to include my idea of the Sathya Centre for Differently Abled Children - center for special education for CP children in their own new premises. My dream is now a reality, the centre will come up in a few months. I am extremely thankful to the lord and all well-wishers who are supporting to enable my dream project come true. I need your help and support. Please think of making a small contribution towards this effort of mine. Live RS LM L RSPlease go to web site www.manasaindia.org ,and do what best you can, and also Please tell your friends. There are institutions like NIMH; Sweekar; Upkar and few other centers catering to medical rehabilitation; but nothing very specific for CP children in terms of education and total rehabilitation in A.P which includes Physio & Occupational Therapy; Counseling and Sheltered Workshop training; etc; which are the needs for such children. To provide persons with cerebral palsy, information on various resources relating to therapy, education, vocation and to empower parents with C.P to manage and care for their wards effectively. [b] Physical – Various therapeutic services inclusive of speech & language therapy and to provide comprehensive diagnosis of persons with C.P. relating with physical health, neurophysiological services, psychological aspects, socio- emotional aspects of development and special education needs. [c] To provide family support services in terms of crisis intervention, and grief. Placement for Jobs, helping parents develop effective coping mechanisms, to help in reference to various institutions if whenever necessary in terms of Health, Psychiatric problems, Job placements etc. All these activities are grouped and planned in 2 phases in terms of the organization’s development. To start the basic services for 20 children with C.P in terms of P.T, O.T, S.T, special education services and family support services. To create physical infra structure for the 1st phase of activities. To introduce self help groups as an activity for empowering parents. The activities will be monitored with case conferences; IEP’s [Individualized Educational Plans]; staff discussions and well monitored system of progress of children. Envisages establishing a residential unit for 15 persons with Cerebral Palsy.